Diana, Princess of Wales (Diana Frances Mountbatten-Windsor, née Spencer) (1 July 1961 - 31 August 1997) was the first wife of HRH The Prince Charles, Prince of Wales. From her marriage in 1981 to her divorce in 1996 she was styled Her Royal Highness The Princess of Wales. She was generally called Princess Diana by the media despite having no right to that particular honorific, as it is reserved for a princess by birthright rather than marriage. Though she was noted for her pioneering charity work, the Princess's philanthropic endeavours were overshadowed by a scandal-plagued marriage. Her bitter accusations of adultery, mental cruelty and emotional distress visited upon her by her husband riveted the world for much of the 1990s, spawning biographies, magazine articles and television movies. From the time of her engagement to the Prince of Wales in 1981 until her death in a car accident in 1997, Diana was arguably the most famous woman in the world, the pre-eminent female celebrity of her generation: a fashion icon, an ideal of feminine beauty, admired and emulated for her high-profile involvement in AIDS issues and the international campaign against landmines. During her lifetime, she was often referred to as the most photographed person in the world. To her admirers, Diana, Princess of Wales was a role model - after her death, there were even calls for her to be nominated for sainthood - while her detractors saw her life as a cautionary tale of how an obsession with publicity can ultimately destroy an individual. The Honourable Diana Frances Spencer was born as the youngest daughter of Edward Spencer, Viscount Althorp, and his first wife, Frances Spencer, Viscountess Althorp (formerly the Honourable Frances Burke Roche). Partially American in ancestry - a great-grandmother was the American heiress Frances Work - she was also a descendant of King Charles I. During her parents' acrimonious divorce over Lady Althorp's adultery with wallpaper heir Peter Shand Kydd, Diana's mother sued for custody of her children, but Lord Althorp's rank, aided by Lady Althorp's mother's testimony against her daughter during the trial, meant custody of Diana and her brother was awarded to their father. On the death of her paternal grandfather, Albert Spencer, 7th Earl Spencer, in 1975, Diana's father became the 8th Earl Spencer, and she acquired the courtesy title of The Lady Diana Spencer. A year later, Lord Spencer married Raine, Countess of Dartmouth, the only daughter of the romance novelist Barbara Cartland, after being named as the "other party" in the Earl and Countess of Dartmouth's divorce. Diana was educated at Riddlesworth Hall in Norfolk and at West Heath School (later reorganized as the New School at West Heath) in Kent, where she was regarded as an academically below-average student, having failed all of her O-level examinations. At age 16 she briefly attended Institut Alpin Videmanette, a finishing school in Rougemont, Switzerland. Diana was a talented amateur pianist, excelled in sports and reportedly longed to be a ballerina. Diana's family, the Spencers, had been close to the British Royal Family for decades. Her maternal grandmother, the Dowager Lady Fermoy, was a longtime friend of Queen Elizabeth the Queen Mother. The Prince of Wales briefly dated Lady Sarah Spencer, Diana's older sister, in the 1970s. After the birth of Prince William, the Princess of Wales suffered from post-natal depression. She had previously suffered from bulimia nervosa, which recurred, and she made a number of suicide attempts. In one interview, released after her death, she claimed that, while pregnant with Prince William, she threw herself down a set of stairs and was discovered by her mother-in-law (that is, Queen Elizabeth II. It has been suggested she did not, in fact, intend to end her life (or that the suicide attempts never even took place) and that she was merely making a 'cry for help'. In the same interview in which she told of the suicide attempt while pregnant with Prince William, she said her husband had accused her of crying wolf when she threatened to kill herself. It has also been suggested that she suffered from borderline personality disorder. The Prince and Princess of Wales were separated on 9 December 1992; their divorce was finalised on 28 August 1996. 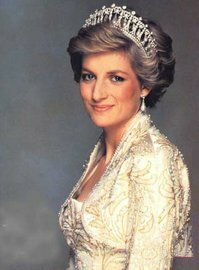 The Princess lost the style Her Royal Highness, and became Diana, Princess of Wales, a titular distinction befitting a divorced peeress. However, at that time, and to this day, Buckingham Palace maintains, since the Princess was the mother of the second and third in line to The Throne, she remained a member of the Royal Family. Starting in the mid-to-late 1980s, the Princess of Wales became well known for her support of charity projects, and is credited with considerable influence for her campaigns against the use of landmines and helping the victims of AIDS. In 1987, when so many still believed that AIDS could be contracted through casual contact, Princess Diana sat on the sickbed of a man with AIDS and held his hand. She showed the world that people with AIDS deserved not isolation, but compassion. It helped change world opinion, helped give hope to people with AIDS, and helped save lives of people at risk. Perhaps her most widely publicised charity appearance was her visit to Angola in January 1997, when, serving as an International Red Cross VIP volunteer, she visited landmine survivors in hospitals, toured de-mining projects run by the HALO Trust, and attended mine awareness education classes about the dangers of mines immediately surrounding homes and villages. The pictures of Diana touring a minefield, in a ballistic helmet and flak jacket, were seen worldwide. (Mine-clearance experts had already cleared the pre-planned walk that Diana took wearing the protective equipment.) In August that year, she visited Bosnia with the Landmine Survivors Network. Her interest in landmines was focused on the injuries they create, often to children, long after the conflict has finished. As of January 2005, Diana's legacy on landmines remained unfulfilled. The United Nations appealed to the nations which produced and stockpiled the largest numbers of landmines (China, India, North Korea, Pakistan, Russia and the United States) to sign the Ottawa Treaty forbidding their production and use, for which Diana had campaigned. Carol Bellamy, Executive Director of the United Nations Children's Fund (UNICEF), said that landmines remained "a deadly attraction for children, whose innate curiosity and need for play often lure them directly into harm's way". On 31 August 1997 Diana was involved in a car accident in the Pont de l'Alma road tunnel in Paris, along with her romantic companion Dodi Fayed, their driver Henri Paul, and Fayed's bodyguard Trevor Rees-Jones. Late in the evening of Saturday 30 August, Diana and Fayed departed the Hôtel Ritz in Place Vendome, Paris, and drove along the north bank of the Seine. Shortly after midnight on 31 August, their Mercedes-Benz S 280 entered the underpass below the Place de l'Alma, pursued in various vehicles by nine French photographers and a motorcycle courier. At the entrance to the tunnel, their car struck a glancing blow to the right-hand wall. It swerved to the left of the two-lane carriageway and collided head-on with the thirteenth pillar supporting the roof, then spun to a stop. As the casualties lay seriously injured in their wrecked car, the photographers continued to take pictures. Dodi Fayed and Henri Paul were both declared dead at the scene of the crash. Trevor Rees-Jones was severely injured, but later recovered. Diana was freed, alive, from the wreckage, and after some delay due to attempts to stabilize her at the scene, she was taken by ambulance to Pitié-Salpêtrière Hospital, arriving there shortly after 2.00 a.m. Despite attempts to save her, her internal injuries were too extensive. Two hours later, at 4.00 that morning, the doctors pronounced her dead. At 5.30, her death was announced at a press conference held by a hospital doctor, Jean-Pierre Chevènement (France's Interior Minister) and Sir Michael Jay (Britain's ambassador to France).